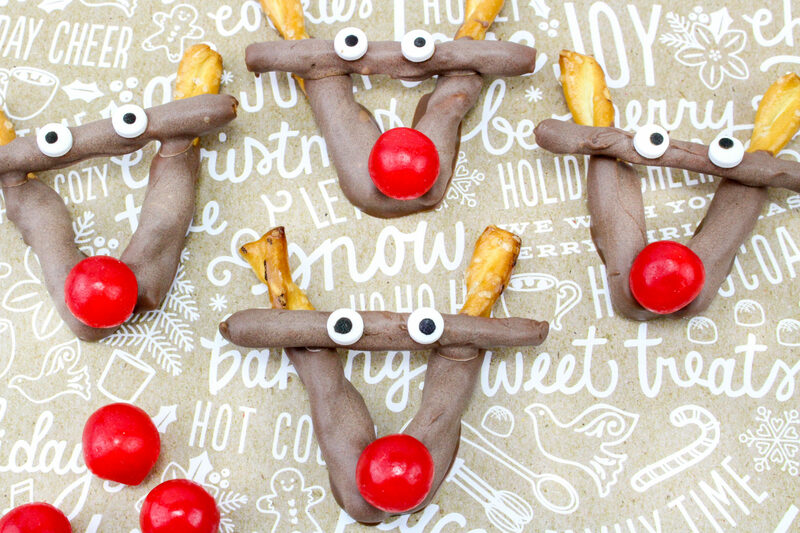 These Rudolph Pretzel Treats are a super fun treat for the holidays! 1. Melt the chocolate in a bowl per the directions on the package. 2. Dip 2 of the twisted pretzels about three fourths of the way up and lay them on a parchment lined sheet in a “V” shape so the chocolate ends touch. Repeat using 10 more of the pretzel twists (or more if you need more than 10). 3. Set a cherry ball on top of the point of each “V”. 4. Dip 6 of the mini pretzel sticks until fully covered and lay one across each “V” on the line where the plain end of the pretzel meets the chocolate part. 5. Place 2 edible eyes on each pretzel stick. 6. Put them in the fridge and let them harden for about 20 minutes. 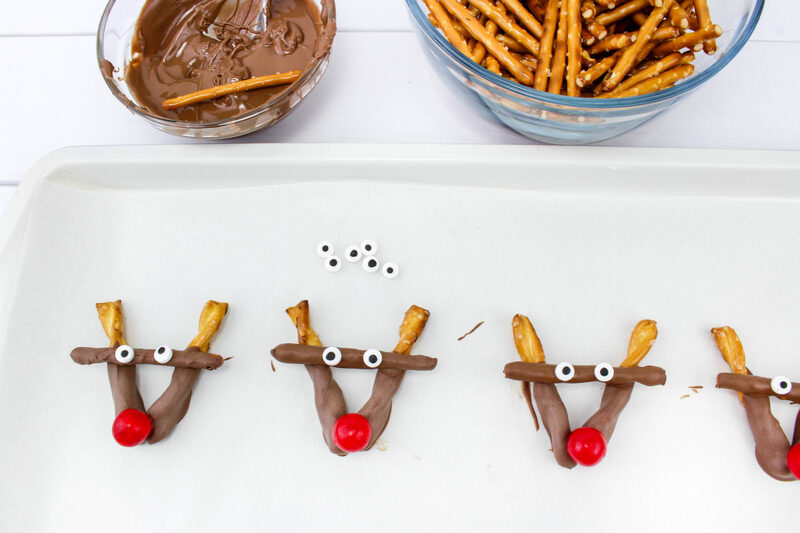 Once the chocolate is hardened, your Rudolph Pretzel Treats are ready. This batch was for my kids because it was just a test batch to make sure that I could make these without totally ruining them (which I did…yay)! The next batch is going with me to a Yankee Swap that I was invited to. I think everyone will absolutely love them! 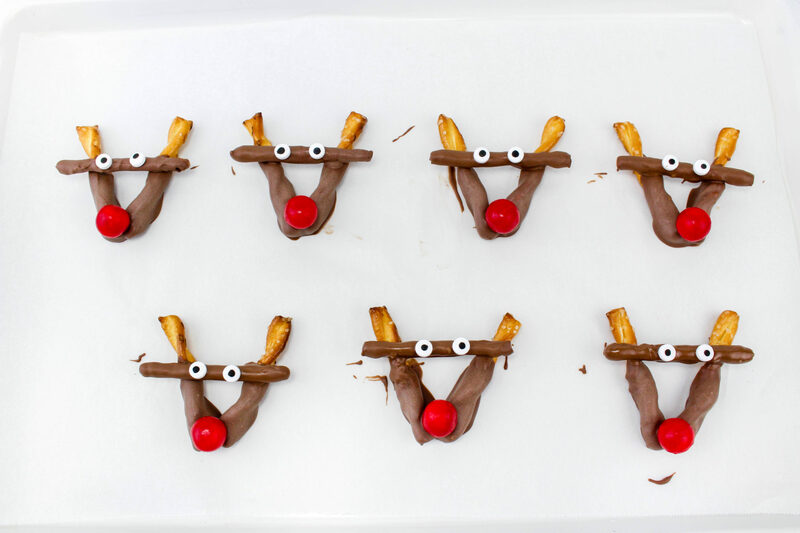 These Rudolph Pretzel Treats are a super fun treat for the kids (and adults)! Those are super cute! I love how festive they and how easy they are to make. Easy and festive is the best combo in holiday food. How adorable! I have to make these with the kids. They love helping in the kitchen, and these look easy enough that the kids could really get in there and have fun with it. Oh these are so cute! They would be perfect for our snacks for girl scouts! Those snacks are cute and very creative! They’d be perfect for any get together including children’s parties or holiday entertaining. These are so cute! My kids and I used to make Rudolf the Red-Nosed Pretzel when they were little. I need to do this with the grandkids. So adorable! My kids love to make holiday treats. We made ornaments that look exactly like this a few years ago. How fun! My daughter would love to make something like this. She loves Rudolph. That looks so cute and what a fun way to make treats with the little ones at home. I will definitely try this with my niece. She would so love doing this. Fun and easy treats for the kids to make. I think I even have everything already here at home. What a unique festive twist! Totally perfect for class parties or even a holiday party at your own home. Kids could totally make these while waiting for Thanksgiving dinner to be done as well. Ohh, these are such cutie idea for the coming holiday season. I am sure the kids in the family will be happy to see this kinds of pretzels. Thanks for the idea! These are seriously so cute and my kids would love making these for their school friends. I think I know what we’re doing for goodie bags this year – thanks for sharing! These are really cute! They will be fun to make with the kids for the holidays! Those are just adorable. I love how easy they look to make. And the nose is the perfect touch! These are such a cute and fun treat for the holiday season. I know my kids would absolutely LOVE to snack on these! My kiddos are pretzel fiends and these are so cute! My kids would love to make these for the holidays. My kids used to be pretzel fiends too. They would have absolutely loved these. These are super cute! Love how easy they are to make and what a great simple snack they are! These are so so cute!! I love chocolate dipped pretzels, these would be fun to make! 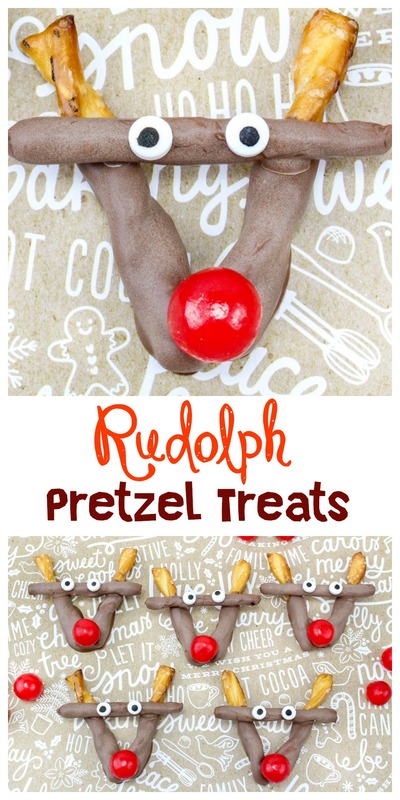 Oh my goodness how awesome are those Rudolph pretzels! I totally need some of these for my own home yum! These are super cute! Pinned them too. I think I’m going to make these with my son when he is off school for the holiday break! Oh how fun! Their little eyes and noses are so cute. I think these would be the perfect holiday treat for me! You always make the cutest treats. I picture you having a jar of flour, sugar, and googly eyes on your kitchen counter. 🙂 I finally started using candy melts so I will be trying these soon! What a clever snack idea! These are so adorable! I love fun and easy snacks like this to make with my kiddo. These are so cute. They would be so much fun to serve at a kid’s Christmas party. Now isn’t this a fun treat for the family especially for the kids! Can’t believe it’s that easy to make as well! So cool! Perfect for the holiday season! They look adorable and easy to make with the kids! Nice nice nice! The kids would love this. I can also involve them in making these treats. It is pretty easy to do and delicious too! These are absolutely adorable! I love the sweet and salty too, so these would be right up my alley! Oh my goodness, how creative and adorable! I would love to make these with the kids. These are very creative. I can see parents making these with their kids during the holidays. LOL, those are so cute and perfect for the season. Definitely a creative way to spice up the holiday season. My youngest is pretty excited about Christmas and it would be nice to make these for her and her siblings! I’m sure they’re going to enjoy these adorable pretzel treats! What a fun idea and how cute are these! So making this with the kids ! These are so stinking cute! Perfect for a class party snack or a snack at your Christmas celebration with family!! These are super cute and I think I want to make these for my cookie exchange. Maybe I can put the reindeer on top of homemade sugar cookies. Adorable! What a lovely treat that the kids as well as the adults will love especially on Christmas gatherings. They’re easy to make which is why they’re even more awesome. This is really cute! Such a perfect holiday treat! These turned out so cute. I like chocolate and pretzels too, always a fave flavor combo. This is putting me in the holiday spirit. I love these and they look easy! Oh, my, kids would love these! The best part they can help you make them! These pretzels are super cute and look easy to make. My kids would love to help with this one, especially when it comes to adding the nose! 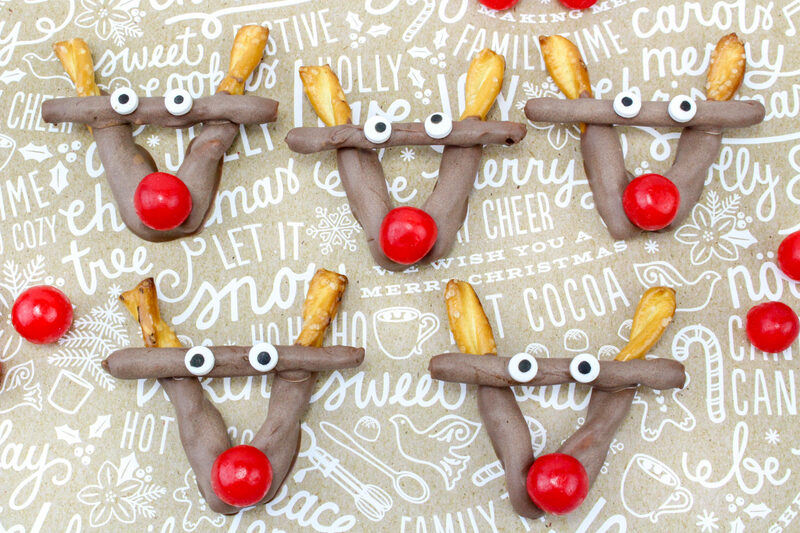 These Rudolph pretzel twists are adorable. What a fun little treat to make with your kids or even as an adult. They would look so cute at a holiday party. These are cute. I love looking for treats that my kids can help me make. I wish I had bought some red round sprinkles yesterday when I was at the wilton tent sale! I will ask help from my kids to make this yummy treat. I know they love helping around in the kitchen, and if the “project” will be making Rudolph Pretzel treats, I can be sure they’ll be in the kitchen in no time. Thanks for sharing the recipe! These are so dang cute! You come up with the cutest ideas! My kids would love to make these. Oh my goodness. How cute are these? I will have to make these with my kids they’ll just love them! Adorable! My daughters would love to help make these for a fun holiday treat this season. omg these are super cute. I am gonna save this to do with my class next month. They will love it.